You are here: Home / Other / Uncategorized / Holiday Giveaway Hop: Have a Pain-Free Winter! Here in Michigan, it’s beginning to look a lot like Christmas! 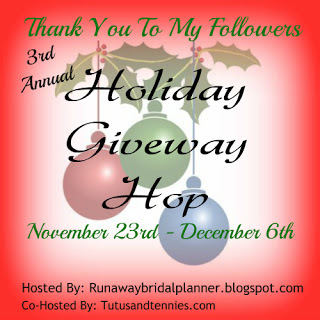 To celebrate, I’m participating in the Holiday Giveaway Hop hosted by Runaway Bridal Planner and Tutus and Tennies. As you may know, DH and I are training for a marathon. In addition, he did several triathlons this summer. Needless to say we have had lots of aches and pains this season! Salonpas sent me a suite of products earlier this year and it has been a lifesaver. I love how it bypasses the stomach and goes directly to where it’s needed. One lucky reader of Wholistic Woman will win the suite of products shown below! Don’t forget to enter these other great giveaways! Unfortunatley running too long causes aches and pains to my hips, but I’m currently in PT working on strengthening that area! I have never heard of this product. But I am currently training for a 50K so this sounds like a great recovery product. I get aches and pains from overuse injuries. Been nursing knee and hip pain for years! My lower back hurts when I sit or run too long. I don’t get too many aches and pains, because I try to stretch, but occasionally I have had overuse injuries in the past. Running causes me regular aches and pains 🙁 The foam roller helps! My husband get sever back pain. I have a bulging neck disc causing me a lot of neck and shoulder pain along with a daily headache. I’m currently in Physical Therapy. I’ve never heard of Salonpas and it sounds like something I need to try. Running causes my biggest aches and pains! I have Osteogenesis Imperfecta which is a brittle bone disease but it also affects my joints and muscles so I live in pain and take pain meds. I would like to try this. A couple of years ago I tore my meniscus and that causes me a whole lot of pain during the winter. Running causes me aches and pains and I would love to win this product that I have never tried! The one thing that hurts my lower back the most is vacuuming. I have a little arthritis but my husband has a bad back and has used Salonpas. That is a great giveaway, I have not tried those products before. thank you so much for joining us! I am not really sure where it stems from but I have been having some sort of leg issues. Sometimes, it’s around the knee and sometimes the entire leg from hip to ankle. Weird. Anyhow, I love trying all products when I am trying to quickly feel better! I have arthritis which causes pain. I have used these patches before and they work great. Unfortunately, my age! And…my activity level. Most of my aches and pains come from exercise and past injury. Great products for those aches and pains! Being on my feet all the time on a cement floor really tends to hurt my back. I have degenerative disk disease in my neck so sitting for long periods of time cause it to hurt. We go on really long all day bike rides which are awesome but ouch! After breking my feet 3 times over the last 5 years and having surgeriers each time, my ankles tend to ache — especially around the hardware. My ankle joints also still really swell with moderate activity. This package would be great.